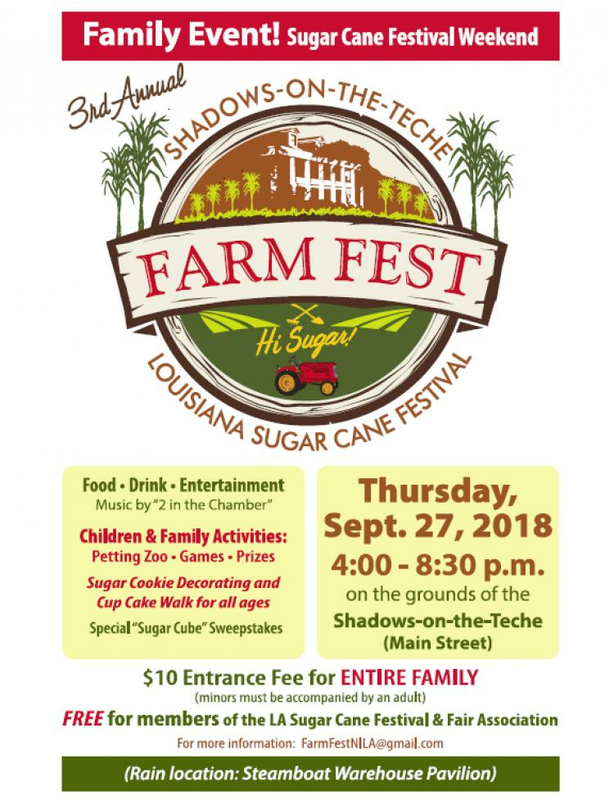 The Shadows is partnering with Louisiana Sugar Cane Festival & Fair Association to bring you Farm Fest! Mark the beginning of the annual Sugar Cane Festival in New Iberia with family fun, live entertainment, and food and drinks. Fun activities include a petting zoo, games, and prizes. Decorate your own sugar cookie, participate in the Cup Cake Walk, and win prizes at The Sugar Cube Sweepstakes! Musical entertainment provided by "2 in the Chamber." Enjoy hamburgers, hot dogs, chili, and other festival foods with a variety of beverages, including beer and wine. Admission is $10 for the entire family. FREE for members of the LA Sugar Cane Festival & Fair Association. Minors must be accompanied by an adult. For more information or questions about the event, contact The Shadows at (337) 369-6446 or shadows@shadowsontheteche.org.